So the other day I mentioned to my husband I wanted a few days away together. It's easy to get wrapped up in being a parent and forget to be a wife, or maybe just not have time to be. But, I think I actually forgot how hard it is to decide where to go, how long to be there, and what to do! Does anyone else have a hard time deciding on trips? Typically we decide on the location first and the timeline is determined by my school calendar, but this time is a bit different. There wasn't a specific place we wanted to go and plan a whole trip around. This time there are way too many options! Any suggestions from the midwest for a week away? good luck on plan your trip. Such a fun look--love the edgy vest against the girly dress and statement necklace :) Omgsh I don't have any good suggestion, but sounds like a blast! I am sure wherever you choose will be a great time! Cute vest! 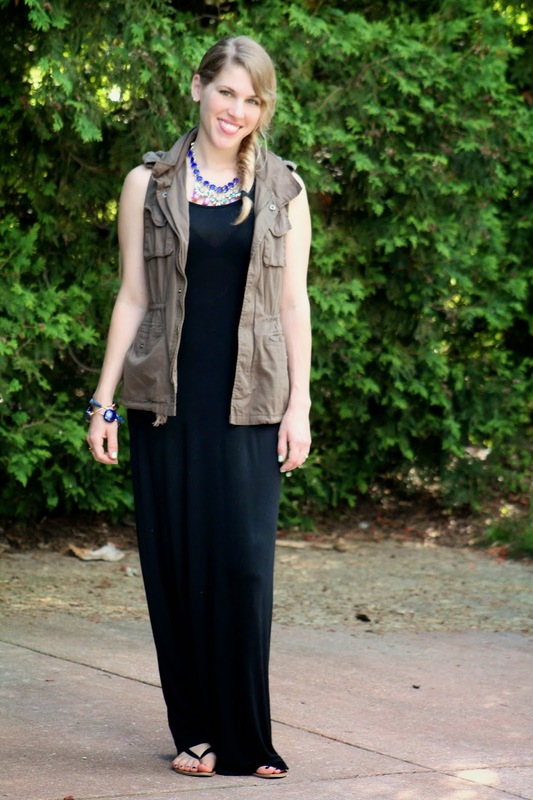 I love it with the maxi and pretty necklace! We are trying to figure out the same thing right now and might rent a cabin in Michigan. 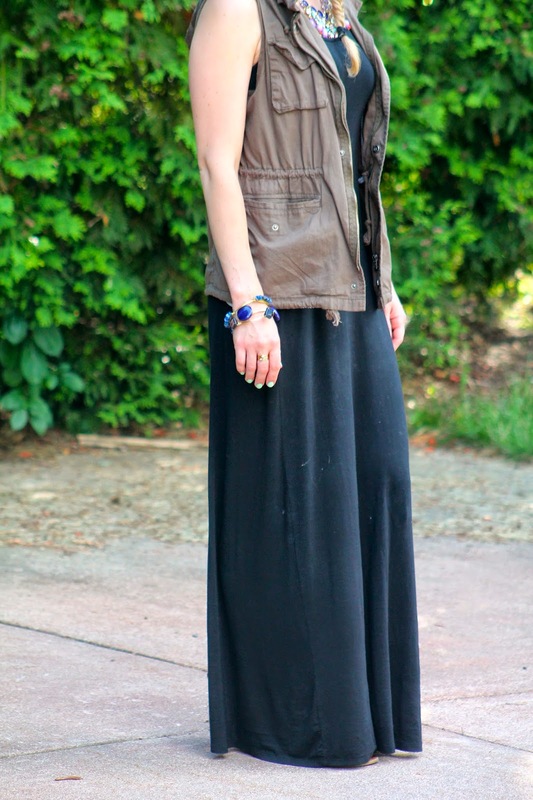 The maxi looks great on you as does the neutral vest. I love that you kind of paired the unexpected. Looks great! Love this look! I need to find a good utility vest! You look so feminine and elegant in this outfit - lovely! And as for getaway suggestions, have you thought of Galena? That sounds so relaxing! We have been debating a road trip to Nashville or maybe Toronto! Thanks for the suggestions! We will have to look into them! We were also thinking about Nashville. I know Matt raves about the BBQ! We were tossing that idea around! We were debating a weekend there or spending the day there since it is only an hour away when we visit my in-laws. It's such a cute little town! So much fun to get to plan a little getaway together. I'm of no help for midwest destinations, unfortunately, but can't wait to hear what you plan! Now onto the outfit! 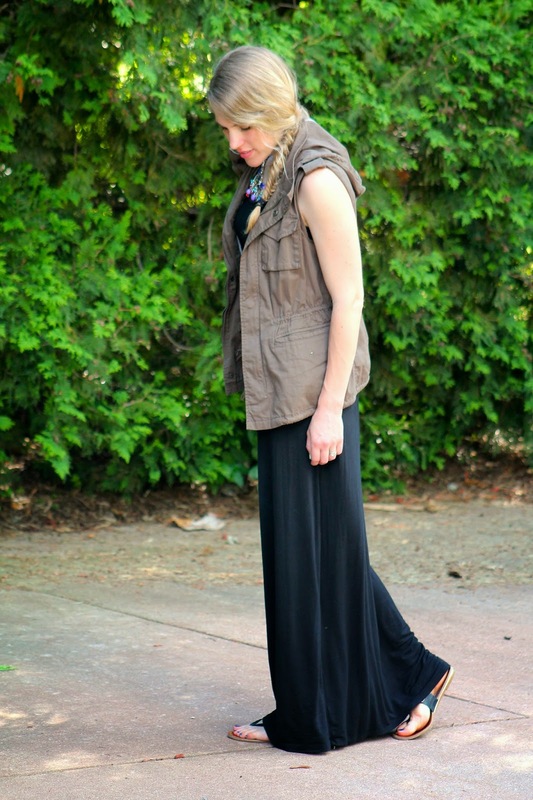 Love your hair, the maxi and pairing it with the vest is sheer genious! Love it Laura. Cute and causal. Love the braid! It's horrible, but we have never been to Door County! I have heard so many good things about it though. Thank you for the suggestions! I knew I went to her site for linkup, and I also vaguely remember I found her somehow via your blog. If you have a clue, could you sent me her website address? 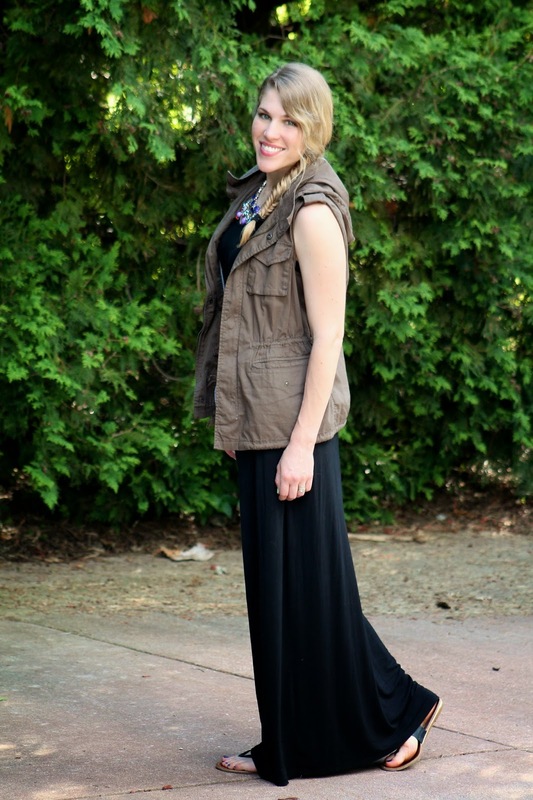 I like the contrast of the tough utility vest over the softness of your maxi dress. What a great combo, especially with your fishtail braid! I think you're talking about Renae from Simple Sequins! Beautiful words. I don't yet have children, but I imagine it is hard. I sometimes forget to be a wife now! A strong marriage is so important though. Love your look! I wish we could! I have heard it is beautiful! Yes, you are right, thank u, both of you! Maybe you two could decide what you want to do? My husband and I have been talking about doing a getaway, and we're probably going to have it revolve around a zoo. The other option is going somewhere where hiking is an option. Good luck deciding!